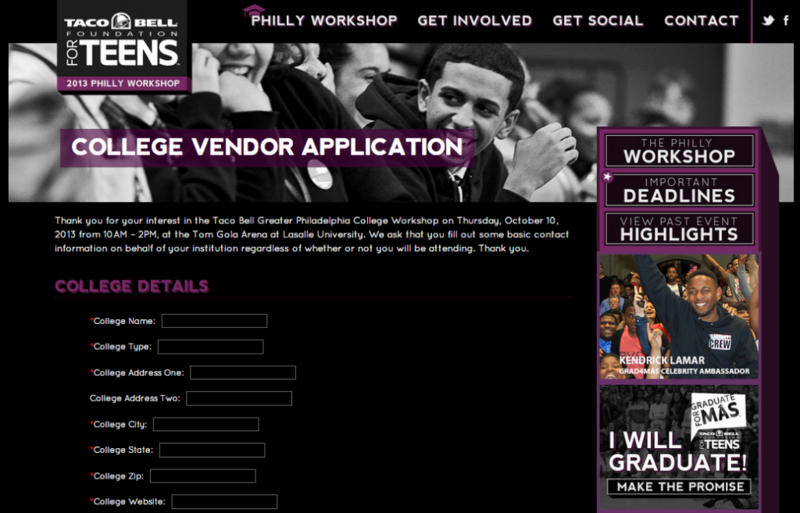 When the Philadelphia and Harrisburg Taco Bell Associations wanted to bring the national message of the Taco Bell Foundation for Teens to a local level, they looked to LevLane to create a college workshop for the high school students in their market. We created a one-day workshop that provides 500 students with an opportunity to explore their higher education options and be eligible to win a scholarship, which is funded by local Taco Bell sales. This year, the national foundation and workshop were rebranded, which meant that our local workshop had to reflect the new look and feel of “Graduate For Mas“. Our interactive team rebuilt the previous Taco Bell Philly Workshop website from the ground up, incorporating the new elements of the campaign to our local workshop. 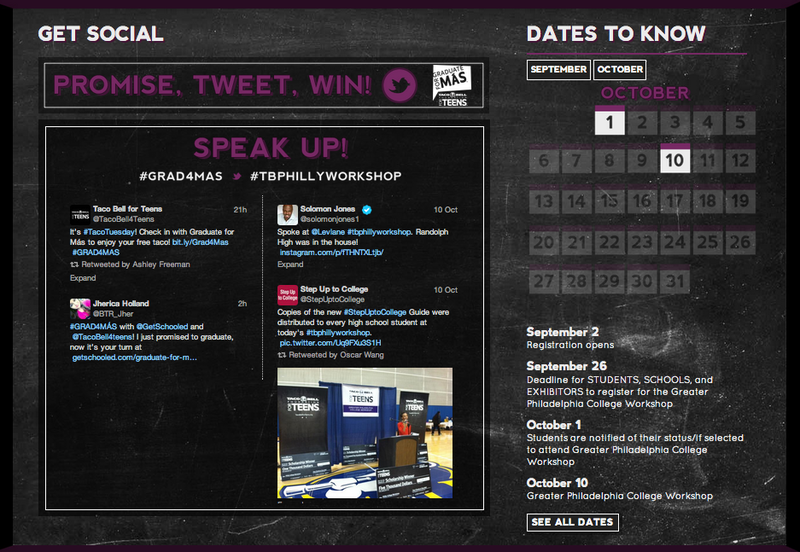 The homepage pulled tweets using the national #grad4mas and local #tbphillyworkshop into a social stream, and featured an interactive calendar of important dates and deadlines. The new website also hosted registration forms for students, high school counselors and higher education exhibitors, streamlining the process for everyone. After the website was up an running, our PR department and Account Managers planned the 2013 Taco Bell Greater Philadelphia College Workshop from start to finish, meaning we invited thousands of high school students, secured 50 college exhibitors, selected Solomon Jones as the keynote speaker, booked the West Powelton Steppers as workshop entertainment, invited Mayor Nutter to attend and address the student attendees, planned the workshop sessions with the Philadelphia Futures, and provided day-of event management, just to name a few.